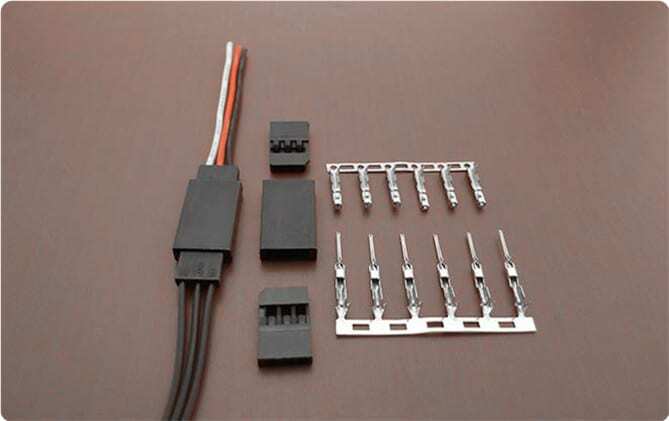 SCT2546 Series connectors are compatible Dupont 2.54mm pitch Wire to wire series connectors. Scondar offers SCT2546 Series as replacement and cheaper alternative of Dupont 2.54mm pitch wire-to-wire connector in a complete package including the male housing, female/receptacle housing, female terminal and male terminal, all manufactured with precision-fitting and durability ensuring accurate mating. Dupont 2.54 mm Pitch connector is a low profile wire-to-wire connector delivering 3.0A current for AWG #22 to #28 suitable for either power transmission systems or chassis wiring. Dupont 2.54 connector has a flexible terminal strip and board stackers for stacking. It is available as either with a shrouded or unshrouded header, with configurations for through-hole, SMT or mixed technology and press fit. The electrical interfaces are fully sealed using a shrouded-header for use applications with high levels of moisture. The shroud helps meet the low smoke, toxicity and flammability requirements of almost all industries. You can expect that your wire-to-wire connector package is undisturbed during the trip and has maintained its vitality even during your production stages, which is why a lot of our customers has raved about our product for both cheaply-priced and, at the same time, resembles the Dupont 2.54mm pitch wire-to-wire product in performance and quality.